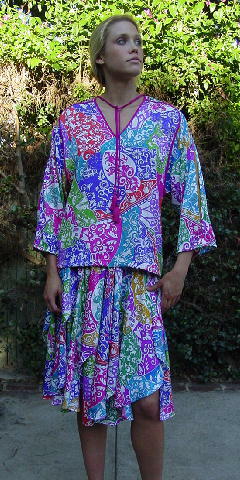 This vintage Diane Freis skirt and top is 100% polyester Georgette and was made in Hong Kong. 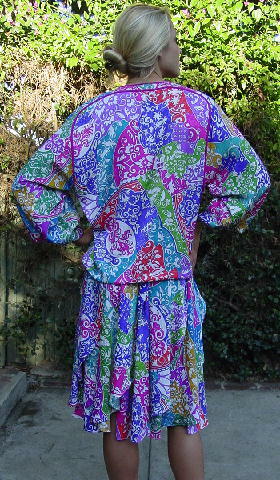 It has a floral and filigree design in magenta, teal blue, lime green, grape, hot pink, curry, emerald green, orange, and white in a tone-on-tone pattern. See the 4th picture for more accurate colors. The top has a wide V neckline with two 21" long ties with fringes and two beads. 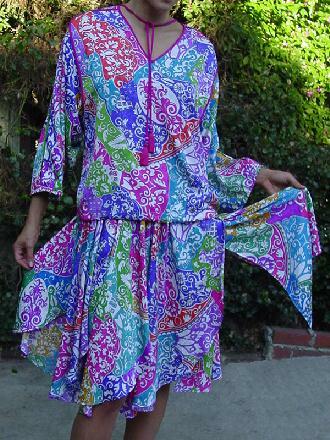 It has batwing sleeves and a 4 1/2" wide open pleat in a solid curry color on one sleeve and lime green on the other. The sleeve ends have loose elastic. The bottom has pull ties with 2 beads at each end. 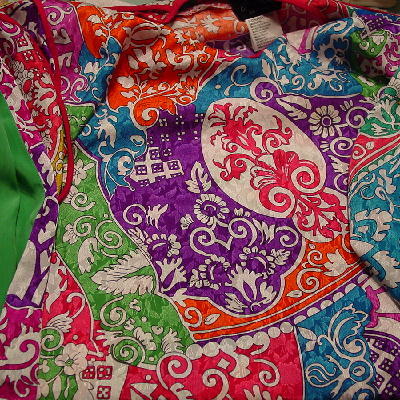 The skirt has 8 panels, layered in a scarf effect. It has an elastic waistband. It's a very flirty style - you can wear the two pieces together or separately. side to side bottom hem 21"
waist to bottom center hem 26"